GO Automobiles Pvt. 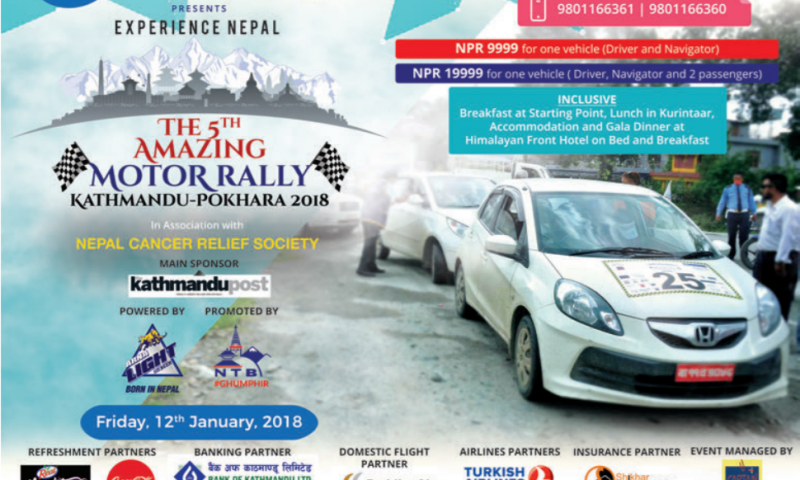 Ltd., the official distributor of Ford vehicles in Nepal, has introduced the new 2018 Ford Aspire in the Nepali market. The 2018 Ford Aspire is available in five variants: Ambiente, Trend, Trend+, Titanium, and Titanium+ with both petrol and diesel engines. The compact sedan is redesigned and the engine is updated which now produces 94bhp in petrol variant, 98 bhp in diesel variant to 86.76bhp in its predecessor. The price of the Petrol variants ranges from Rs. 25.5 lakhs for the base model i.e. Ambiente variant, to Rs. 34.5 Lakhs for the full option i.e. Titanium+ and the price of the Diesel variants come with a bigger price ranging from Rs. 28.5 Lakhs to Rs. 36.5 Lakhs. All the variants of the 2018 Ford Aspire are now available for pre-bookings only. The 2018 Ford Aspire is powered by the 1.2-litre motor from Ford’s Dragon series of Petrol engines which is available with the five-speed manual gearbox. The engine produces 94bhp power and 120Nm of torque. The pre-facelift Ford Aspire was sold with an older 1.2-litre petrol engine. 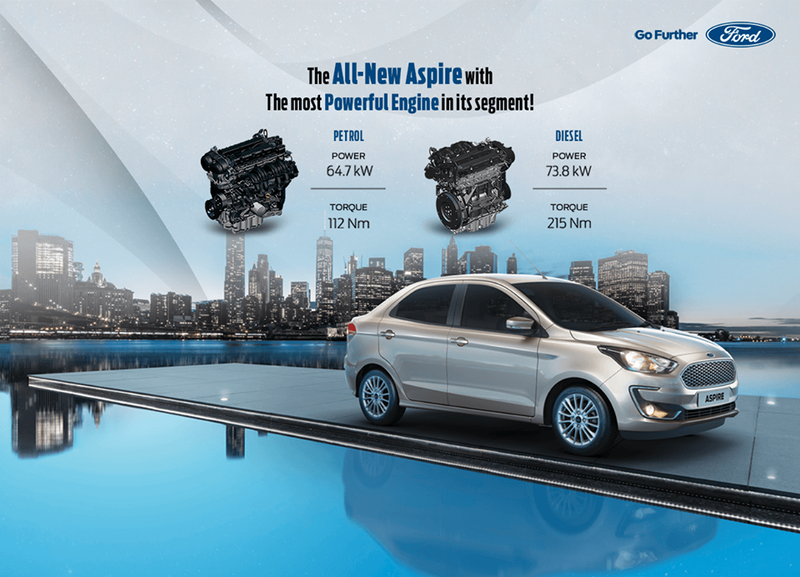 The Ford Aspire Facelift now also comes with the new 1.5-litre petrol engine for the automatic variant. The automatic variant produces a healthy 123bhp and 150 Nm of torque. The automatic variant is only available in Titanium variant of the Petrol engine. Whereas, the diesel variant is powered by the 1.5-litre motor from Ford’s Dragon series of the Diesel engine which is available with the five-speed manual gearbox. The engine produces 98bhp and 215Nm of torque. The diesel variant provides more fuel efficiency than the petrol variant, 26.1 km/l to 20.4 km/l (Ambiente, Trend, Trend+) and 19.4 km/l (Titanium, Titanium+). 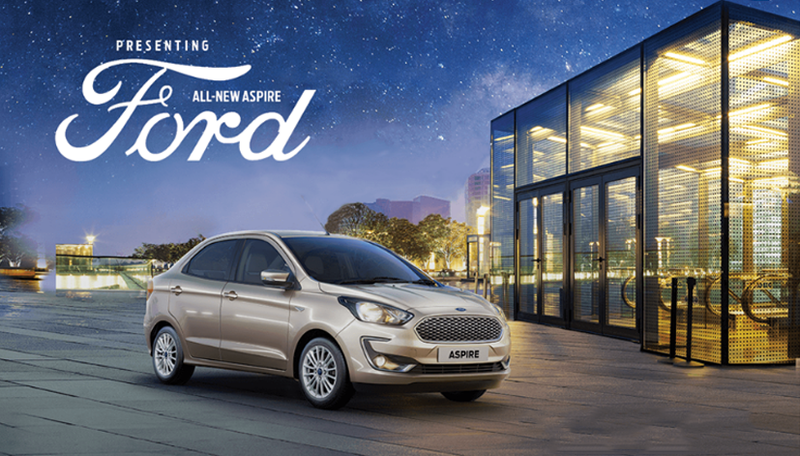 In terms of exterior design, the Aspire looks sportier now, with its more sophisticated headlight and grille combo. The Aspire is available in seven color schemes which give the Aspire an attractive look. The headlights are sophisticated but lack of projector headlamp is a downside. Front Fog Lamps and Rear Defogger is available but only for Trend+, Titanium, and Titanium+ variants. 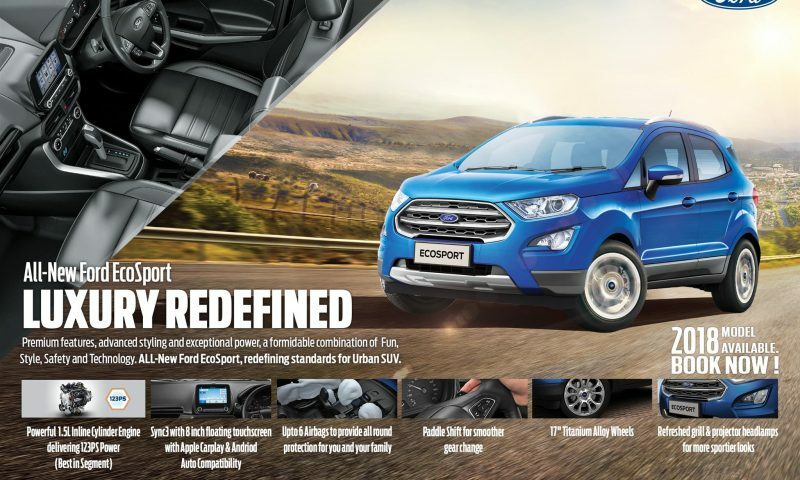 There aren’t many changes to the rear except for the redesigned bumper, but what Ford has done is upped the wheel size; top variant Aspires (Titanium, Titanium+) now run on 15-inch alloy wheels with 195/55 R15 tyres. The bigger alloy wheels have a simple yet classy design and look more proportional to the dimension of the car. The interior of the Ford Aspire has the familiar two-toned black and beige dashboard. The major change on the inside is the addition of 6.5-inch touchscreen with the Ford Sync 3 system on the top of the line Titanium+ cars. The experience is heightened with the presence of mobile connectivity with Apple CarPlay & Android Auto. The interior has a two-tone (Sand+ Light Oak) Environment with a Fabric coated seats. The lack of leather seats is a downside but the riding experience more than make up the downside. The overall height, length and ground clearance remains the same but the width of the car has been increased. The dimension is 3995mm length, 1704mm width, and 1525mm height. The Dimension of the new Aspire is better due to which it isn’t compact like its competitor Maruti Suzuki Swift. 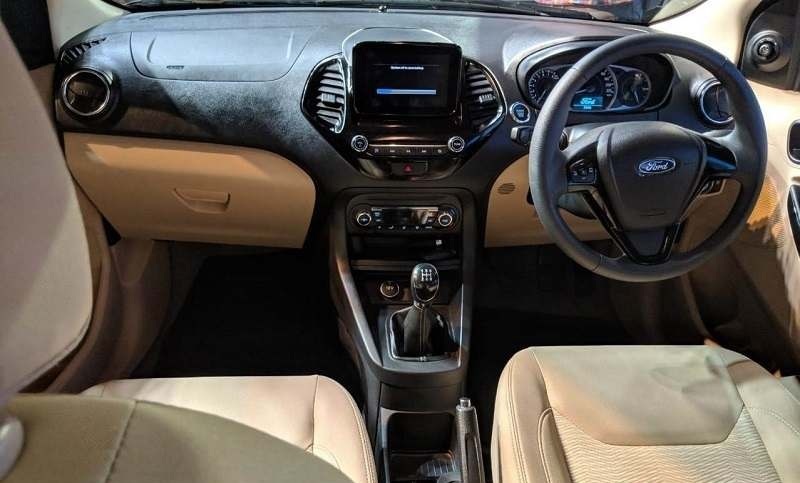 The new Ford Aspire comes with a lot of other features like Dual Airbags, ABS (Anti-lock Braking System) with EBD, parking sensors, parking camera. The high-end variant Titanium+ has an availability of 6 air bag (Side & Curtain Airbags). The high-end variant (Titanium, Titanium+) is equipped with push-button start, rear-view camera. Emergency Assistance is another safety feature that is only available in Titanium+ variant. The 2018 Ford Aspire facelift is a compact sedan with lots of updates and a better engine. Aspire seems peppier, youthful and sporty than its predecessor. The car provides better performance than its competitors. On the overall perspective, the 2018 Ford Aspire is carrying on the legacy of its predecessor. It has been very carefully tuned and specified to match its asking price. If you are in the market for a sedan with a sporty look, good engine, good infotainment system, and a good safety feature, the Ford Aspire 2018 might just be the car for you.